The Live Feed function is an optional extra which requires a yearly in-app subscription. Like all my subscription options, you get your first 7 day's free to let you check it out to see if you really want the option enabled in the app. The Live Feed concept is centered around having access to your Generation and Consumption data in near real-time. Without access to near real-time data, the usefulness of the Live Feed page is reduced. The pvoutput.org website data is not real-time. Hence, this part of the app relies on being able to query other data sources directly. When configuring a Live Feed, you need to define both a Generation source and a Consumption source. These could be different data sources. For example, you could source your Generation from a Fonius inverter and your Consumption data from Efergy. Efergy (Energyhive) - provides both generation and consumption data. Data is updated every 6 seconds. 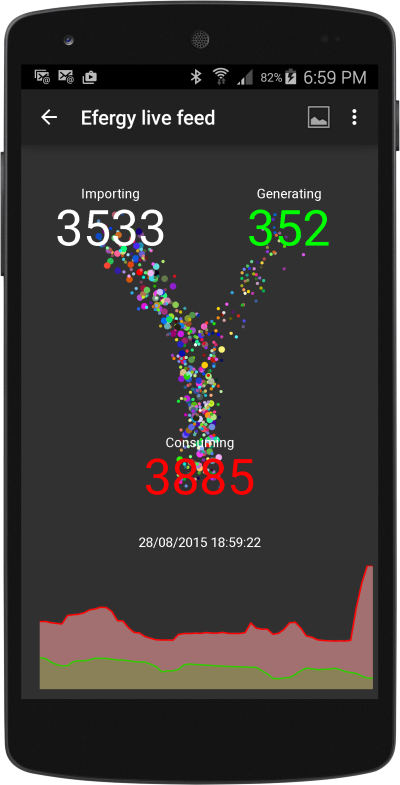 The app will query Energyhive every 10 seconds. VeraLite - If your VeraLite home automation controller knows your current Generation and Consumption, then you can use Live Feed to query your VeraLite to get this data. SolarEdge - provides Consumption data only and I'm led to believe it is limited to 300 requests per day per source IP. Hence, I've limited the app to querying SolarEdge to every 5 minutes. Fronius - provides generation data by default but will also provide consumption data if you have the Fronius Smart Meter installed. The app will query your local network inverter every 10 seconds.